Product code: ES6599 Categories: Modern & Retro Jewellery, Modern Rings & Engagement Rings. 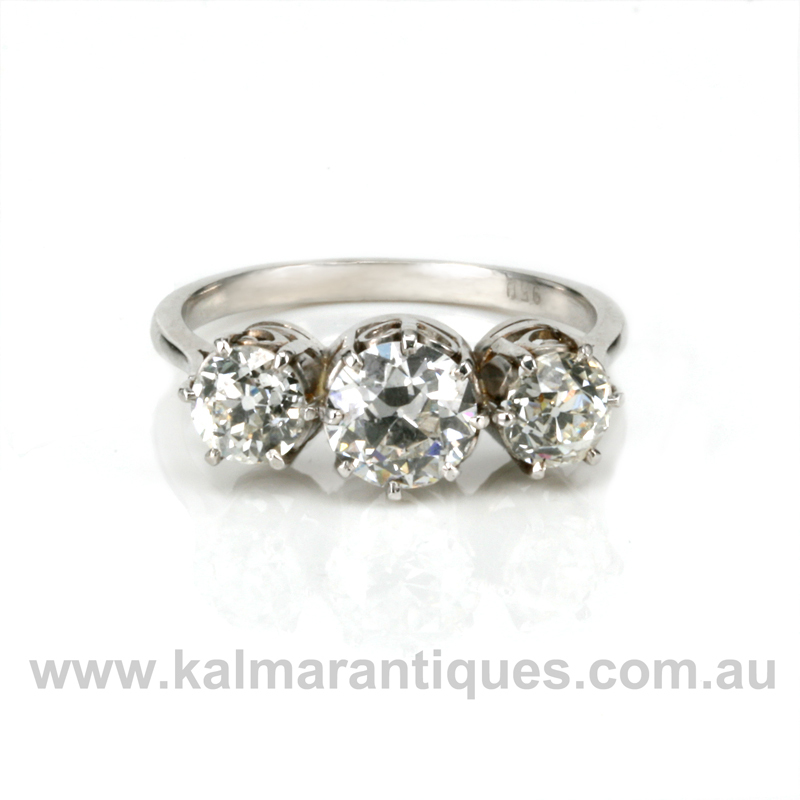 Here is a great combination with old meets new in this 3 stone diamond engagement ring with antique cut diamonds. Hand made in platinum, platinum is the purest of all the precious metals used in jewellery and has a pure white colour that always looks so good and this ring has really been so well made. The diamonds set into this engagement ring are all the fabulous European cut diamonds which have 58 facets like today’s round brilliant cut diamonds, but slightly different angles on the facets. They really do have the charm of yesteryear and the three diamonds total 2.29 carats in weight and are G in colour and Vs to Si in clarity which means they are white and you can not see any inclusions with the naked eye and of course with diamonds this size, they sparkle magnificently. From one end to the other, this distance measures 19.4mm across by 7.7mm wide at the centre diamond and the design of this engagement ring means that a wedding band will sit perfectly along side it. 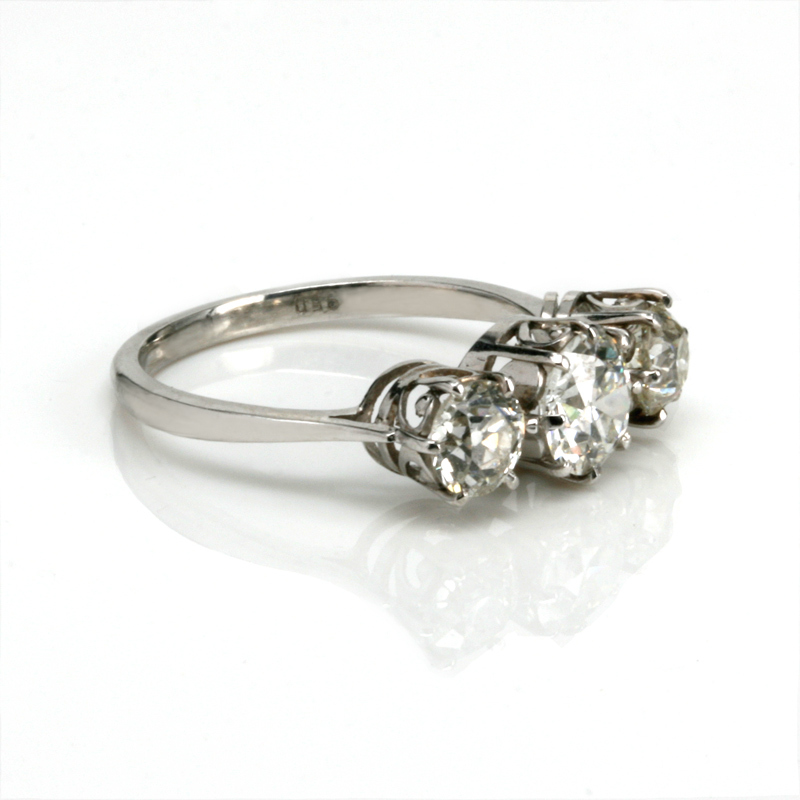 So elegant and charming, this engagement ring really does have it all where old meets new so seamlessly.